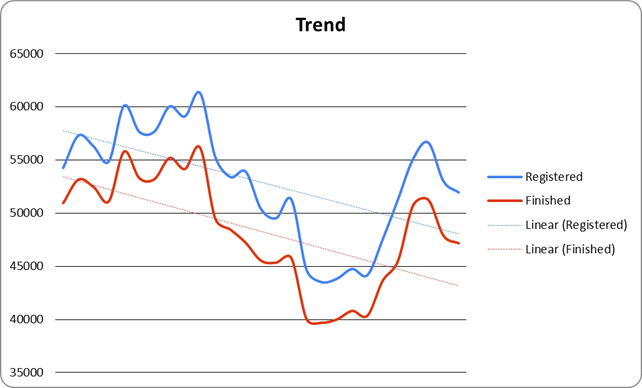 This chart shows participation from 1987 forward, with trend lines added. 1987 was selected as the start date as this is when the event reached maturity (actually slightly before it reached maturity). There are many factors that influence participation including weather and local demographics. Would be interesting to compare this trend to other races in the NW to see if this is a local issue or a general issue for running events. It is likely that the largest group of non-finishers are people who registered but did not show up on the day of the run. A reasonable guess is that at least 70%-80% of participants are local or just drove in for the day and do not stay overnight. 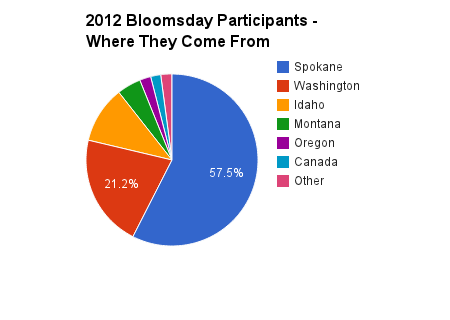 Bloomsday is primarily a local Spokane/NE WA/N ID event. 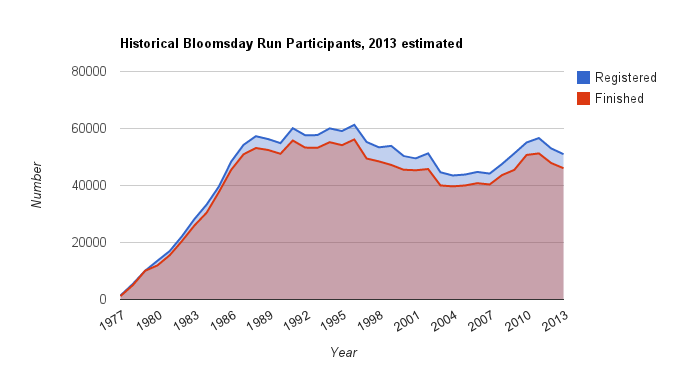 The distribution of participants by geography affects the economic impact of Bloomsday. Those from out of town are more likely to stay in hotels and spend money at restaurants or shopping venues. While those from in-town and the local area may also spend money at restaurants and shopping, this does not necessarily add to the Spokane economy. This is because it is spending money locally that would have otherwise been spent locally anyway and does not necessarily represent a net gain to the local economy. 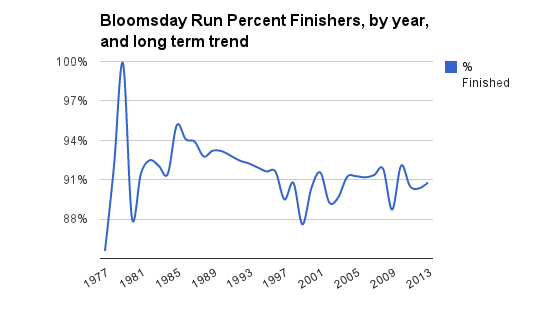 Whether we buy a hamburger a week ago or buy a hamburger this week because of Bloomsday, the impact is the same – no net gain. The main economic impact comes from those who are from outside the area. There are both positive and negative economic impacts. The positive ones are mostly obvious, coming from true out of town visitors, the negative ones include businesses being closed and businesses that see lower sales on the day of the event because of the event, and disruptions to local traffic and local activities.